This example shows how to use the UI API. We will demonstrate how to create several DIPY UI elements, then use a list box to toggle which element is shown. First, a bunch of imports. Let’s start by drawing some simple shapes. First, a rectangle. Then we can draw a solid circle, or disk. Add an inner radius to make a ring. Now let’s display an image. First we need to fetch some icons that are included in DIPY. Now we can create an image container. Let’s create some buttons and text and put them in a panel. First we’ll make the panel. Then we’ll make two text labels and place them on the panel. Note that we specifiy the position with integer numbers of pixels. 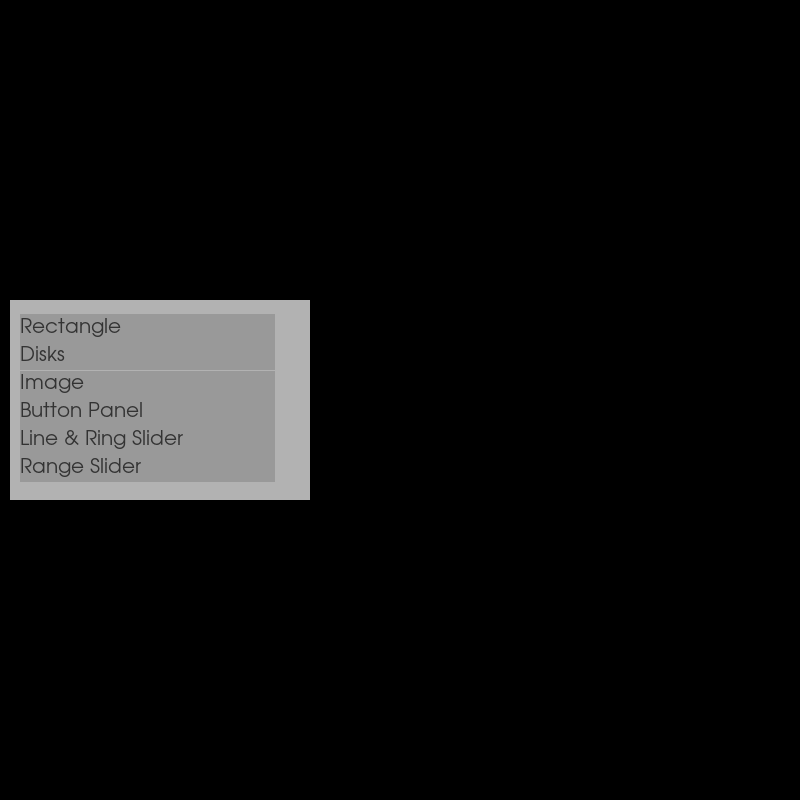 Then we’ll create two buttons and add them to the panel. Note that here we specify the positions with floats. In this case, these are percentages of the panel size. We can add a callback to each button to perform some action. Let’s add a cube to the scene and control it with sliders. Now we’ll add two sliders: one circular and one linear. We can use a callback to rotate the cube with the ring slider. Similarly, we can translate the cube with the line slider. Finally, we can add a range slider. This element is composed of two sliders. The first slider has two handles which let you set the range of the second. We just added many examples. If we showed them all at once, they would fill the screen. Let’s make a simple menu to choose which example is shown. We’ll first make a list of the examples. Now we’ll make a function to hide all the examples. Then we’ll call it so that none are shown initially. To make the menu, we’ll first need to create a list of labels which correspond with the examples. Now we can create the menu. Then we will use a callback to show the correct example when a label is clicked. Now that all the elements have been initialised, we add them to the show manager.